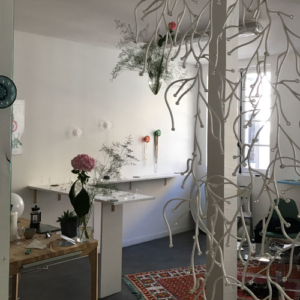 Adeline Cacheux, following a long working experience in the heart of contemporary art galleries (Marian Goodman, Emmanuel Perrotin) and studies in Art History, set's her eyes on jewelry making. She then went to Ecole Boulle and created eponymous brand in 2007. Her approach to jewelry design is to see shape and form as the focus. Unpretentious of an absolute innovation, Adeline Cacheux simply prefers a non-conformist approach to the craft. She likes to create jewels with a focus on quality, originality and confidence. What seduces in her jewels is the sobriety and the extreme creativity, this mix of contradictions : graphic yet feminine, sober yet striking, rock yet elegant. A subtle alliance of a rock n' roll spirit and timeless elegance. All its products are designed and made totally by hand in her Parisian studio. Each collection comes in limited editions. Adeline Cacheux is also a free-lance designer and has been collaborating with prestigious names such as Christofle. Her intimist and luxury approach to jewelry making made her collaborate with Commune de Paris, 1871 and most recently with Didier Guérin Joaillerie.